Seared salmon, braised lamb, sauteed beef: sounds delicious, but what about vegetables? Here in the Middle East we love our kebabs, shawarmas and barbecues, but recently The Food Network aired an episode of Iron Chef America that gave us food for thought – a completely vegetarian menu. A vegetarian menu is not a new idea, so naturally the show added a little twist. On Sunday 29 August,2010, the Iron Chef America featured Iron Chef Masaharu Morimoto facing off visiting chef Amanda Cohen in the first ever strictly vegetarian competition. Each chef had to come up with and prepare a three course meal using a secret ingredient in each dish. In this episode the secret ingredient was broccoli. Can you imagine a dessert based on broccoli, or even a dessert with some broccoli in it? Seems impossible, but these chefs were up to the challenge. Chef Morimoto came up with a shaved broccoli ice with broccoli syrup, served next to a waffle cone. Chef Cohen concocted a broccoli ice-cream with corn brittle and carrot caramel sauce. Who ever said vegetables aren’t versatile? Working with vegetables is nothing new for Cohen since she opened up her vegetarian restaurant DirtCandy a few years ago. 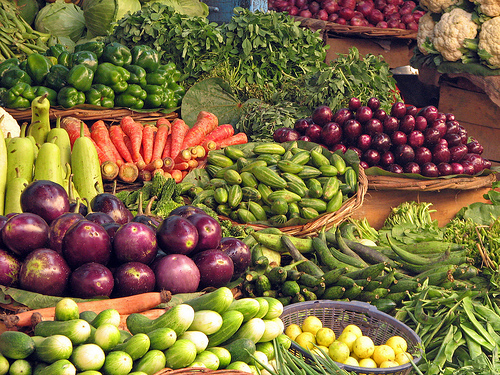 Many people consider a vegetarian diet for political reasons as connected to animal rights, while others are more concerned with the health aspect of the diet. Neither of these ideals led Cohen to start up a vegetarian restaurant;for her it is about the art of vegetarian cooking. Watching this show is enough to make anyone consider switching to a vegetable-based diet. All the delicious foods prepared by these two talented chefs are mouth-watering, even via the television screen. There are many vegetarian options we can easily add to our diet. While a vegetable dessert might be a bit of a stretch for most of us, it is definitely worth while adding more vegetables to our daily diet and experimenting with flavours. I love Iron Chef and I was SO EXCITED when I heard that Amanda Cohen was going to be there. Yeah go vegs. OH MY GD I was so upset after i saw the show. I am vegan and I was hoping she would show the values of veggies. SHE MUST HAVE USED 10lbs of BUTTER. And they teased her about it the whole show. It was horrible and the worst thing I ever saw. Marimoto deserved to WIN he didn’t use much if any and his food was light and showed off veggies in a beautiful way. When you consider yourself veggie, you might want to take a look at what really is in your food. Tks been waiting to say this to someone since I saw the show.